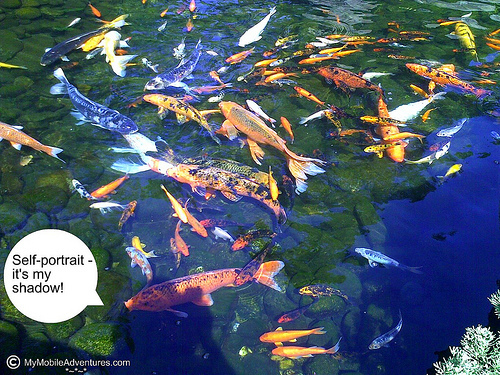 Oh my that’s a lot of koi. Nice entry. Nice to meet your shadow. I bet they would give one heck of a pedicure. Ouch! The koi photograph beautifully and I do see the portrait of your shadow. So many wonderful watery scenes on Watery Wednesday. I love Koi. Would be so fun to have some if they didn’t have spend almost the whole winter inside! lol Nice shot of the photographer as well. Great shadow shot…were you trying for it or was it a surprise??? What an unbelievable photo! It looks almost psychedelic. Great job. Have a wonderful day. Kewel…..koi photograph. I especially like how you included your shadow. Tink, nice job! Becky, it was a total surprise – didn’t realize I was capturing it until I got home. Can almost feel how fun it was there. so colorful and beautiful koi! love the photo. wow, a fabulous photo and yep I’m with James what a pedicure, euuuhh!!! Awesome shot- I love ponds! I love that you mobile blog…WTG! Wow Tinks.. those are cool! I love seeing all the different colors and patterns of the Koi. Thanks for sharing. Happy OW! Looks like a feeding frenzy to me… I guess they feel safe and have no predators around to feed on them…. What a colorful and beautiful shot!! yOU HAVE A BEAUTIFUL SUBJECT TO PHOTOGRAPH.